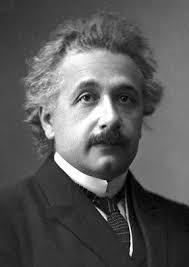 Albert Einstein (14 March 1879 – 18 April 1955) was a German-born theoretical physicist who developed the general theory of relativity, one of the two pillars of modern physics (alongside quantum mechanics). While best known for his mass–energy equivalence formula E = mc2 (which has been dubbed "the world's most famous equation"), he received the 1921 Nobel Prize in Physics "for his services to theoretical physics, and especially for his discovery of the law of the photoelectric effect". The latter was pivotal in establishing quantum theory. 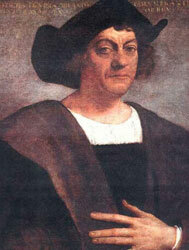 Christopher Columbus (born between October 31, 1450 and October 30, 1451 – 20 May 1506) was an Italian explorer, navigator, and colonizer, born in the Republic of Genoa, in what is today northwestern Italy. 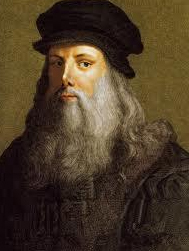 Under the auspices of the Catholic Monarchs of Spain, he completed four voyages across the Atlantic Ocean that led to general European awareness of the American continents. Those voyages, and his efforts to establish permanent settlements on the island of Hispaniola, initiated the Spanish colonization of the New World. In the context of emerging western imperialism and economic competition between European kingdoms seeking wealth through the establishment of trade routes and colonies, Columbus's speculative proposal, to reach the East Indies by sailing westward, eventually received the support of the Spanish crown, which saw in it a chance to gain the upper hand over rival powers in the contest for the lucrative spice trade with Asia. During his first voyage in 1492, instead of reaching Japan as he had intended, Columbus landed in the Bahamas archipelago, at a locale he named San Salvador. Over the course of three more voyages, Columbus visited the Greater and Lesser Antilles, as well as the Caribbean coast of Venezuela and Central America, claiming them for the Spanish Empire. Mohandas Karamchand Gandhi (2 October 1869 – 30 January 1948) was the preeminent leader of Indian nationalism in British-ruled India. Employing non-violent civil disobedience, Gandhi led India to independence and inspired movements for civil rights and freedom across the world. The honorific Mahatma (Sanskrit: "high-souled," "venerable")—applied to him first in 1914 in South Africa,—is now used worldwide. He is also called Bapu (Gujarati: endearment for "father," "papa.") in India. 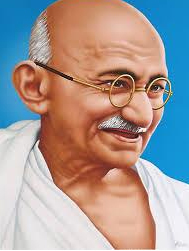 Born and raised in a Hindu, merchant caste, family in coastal Gujarat, western India, and trained in law at the Inner Temple, London, Gandhi first employed non-violent civil disobedience as an expatriate lawyer in South Africa, in the resident Indian community's struggle for civil rights. After his return to India in 1915, he set about organising peasants, farmers, and urban labourers to protest against excessive land-tax and discrimination. Assuming leadership of the Indian National Congress in 1921, Gandhi led nationwide campaigns for easing poverty, expanding women's rights, building religious and ethnic amity, ending untouchability, but above all for achieving Swaraj or self-rule.